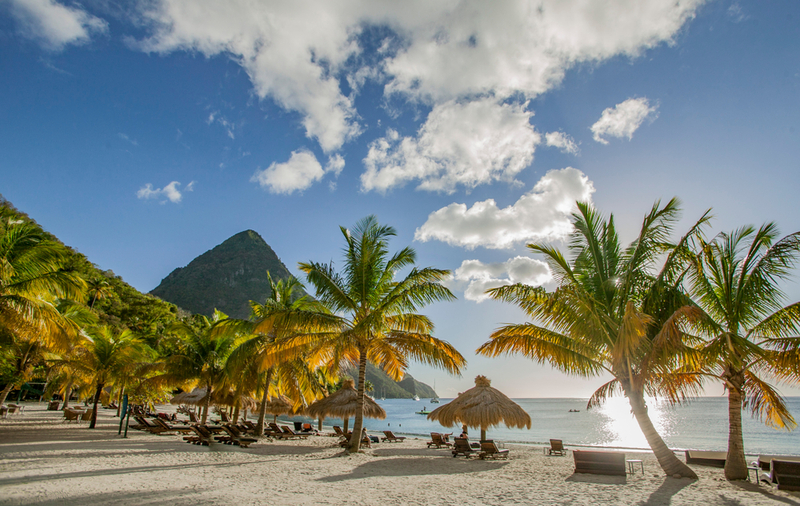 Strolling hand-in-hand in the sand along some of the world’s most beautiful beaches, retreating to posh guest rooms in unbelievably luxurious resorts, soaking up the boutique intimacy of a small island of colorful villages – Saint Lucia presents the very definition of a romantic getaway. Saint Lucia has long been a favorite vacation destination, thanks to its lush jungle interior guarded by the majestic, awe-inspiring Twin Piton mountains, a picturesque coastline ringed by white-sand and volcanic black-sand beaches, a sky full of glorious tropical sunshine, and a welcoming people who are proud of their unique mix of heritages and cultures – and who love to share their secluded tropical heaven with visitors. Here’s how to spend five days on the idyllic island. Pack a bag and head to Reduit Beach. Take a leisurely stroll down the long stretch of golden sand, set up your beach umbrella, then have your pick of water activities – including swimming and kayaking in the calm, clear waters. When it’s time for lunch, there are plenty of dining options at Rodney Bay Village, which is within walking distance from Reduit Beach. Indulge in local cuisine, like fresh-caught seafood, and sip a glass of rum punch while overlooking the turquoise waters. Take a scenic Jeep journey through Saint Lucia’s banana plantations, fishing villages, and the towns of Anse La Raye and Canaries, and take an easy hike to beautiful Piton Waterfall, where you can also swim. 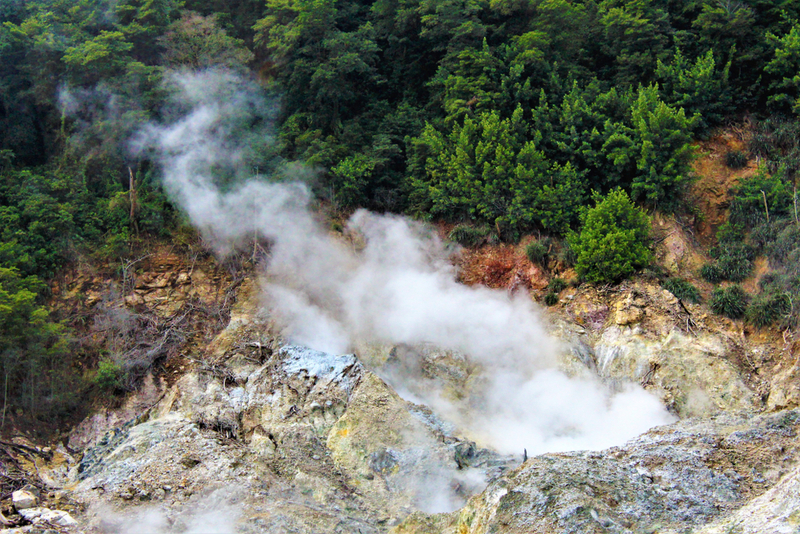 In Soufriere, the island’s oldest town, see the soaring twin peaks of The Pitons and visit Sulphur Springs – the world’s only “drive-in volcano” – where you can luxuriate in the soothing mud baths, followed by some delicious creole cuisine. 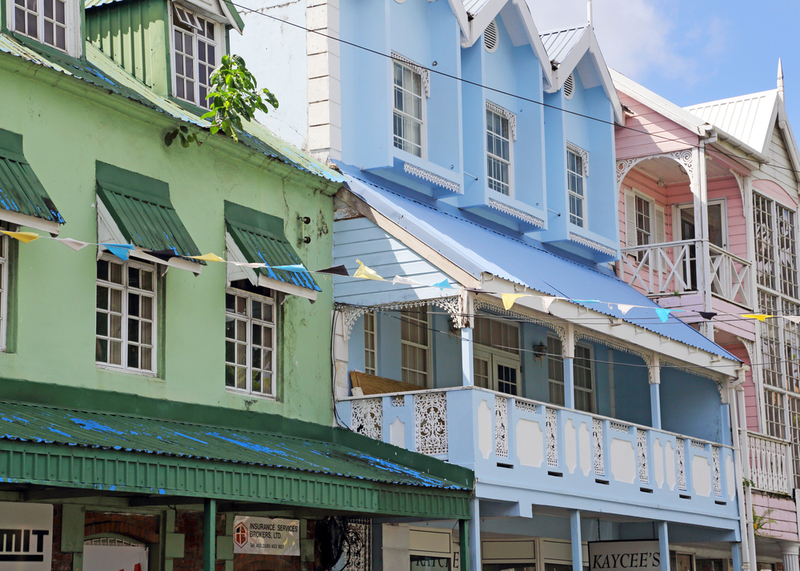 Castries, the island’s Victorian capital and largest city, is a hot spot of activity, with its cruise ship docks, open-air markets, duty-free shopping, and entertaining nightlife. Stroll the quaint streets, lined with historic 19th-century colonial architecture, and explore the Cathedral of the Immaculate Conception, the largest church in the Caribbean. From the outside, it’s a classic gray stone structure, but inside it’s a mix of reds, oranges, greens, yellows, and purples on the high walls and ceilings, a reflection of the colorful spirit of the Caribbean. The Cathedral is located just off Derek Walcott Square, a park named in honor of the Nobel Prize-winning poet. Nearby, mingle with the locals while bargaining for the perfect present or souvenir (as well as fresh produce and spices) at the Castries Central Market. Alternatively, La Place Carenage Shopping Plaza is open six days a week for duty-free retail therapy for local fashions and crafts, as is Duty Free Pointe Seraphine Shopping Complex, great for finding designer fragrances, jewelry, and clothing. Join the Piton Sunset Cruise and take in the gorgeous scenery as you make your way to the majestic Pitons, a UNESCO World Heritage Site. Swim and snorkel in the blue waters at the base of the volcanic peaks. Cruise back up the coast as the sun lights up the sky with orange, amber, and gold hues – you may even see the elusive “green flash” sunset phenomena. Pass through Marigot Bay and dance to some island rhythms while you enjoy drinks and delicious appetizers. 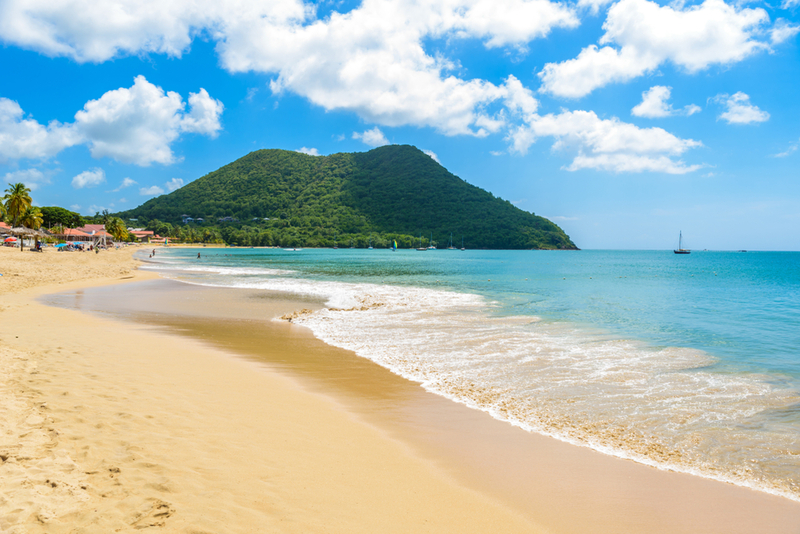 Get back into that beach mode before you tearfully depart Saint Lucia. On an island that borders two seas, there’s always more beaches to visit, so head to popular Anse de Sables, a mecca for windsurfers and sun worshipers, or Jalousie Beach, with its absolutely stunning location between the two Piton Mountains. Feeling inspired? 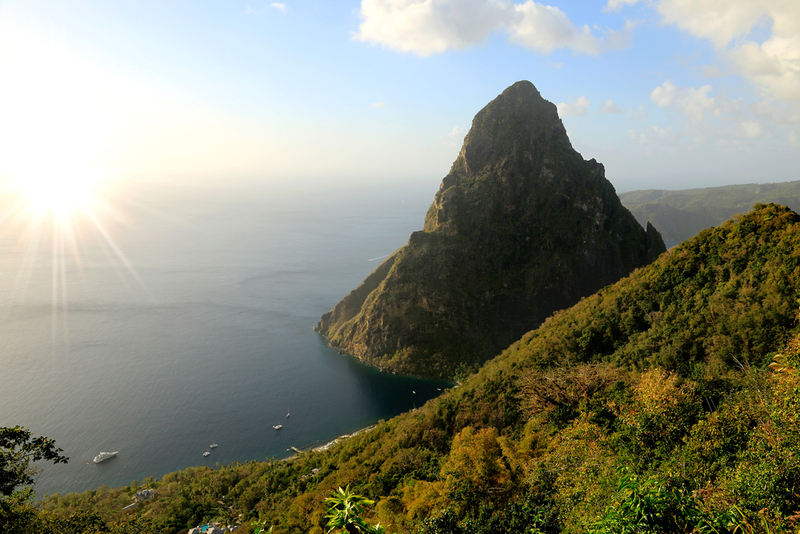 Contact your travel agent today to start planning a romantic getaway to beautiful St. Lucia.